The 35 Roller Transfer is mounted in a Model DC-60 or DCEZ-60 and is used to transfer product from one DC-60 to another DC-60. 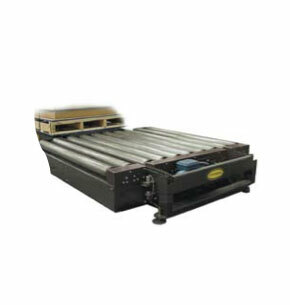 The 35 Roller Transfer uses 3 1/2" dia x 9 ga. rollers mounted on 6" centers. Air bags lift the transfer mechanism. The 35 Roller Transfer uses a 1/3 HP gearmotor to provide constant 30 FPM. The 26 CRPT is used to rotate products up to 360 degrees. The turntable is powered by a shaft mounted gearmotor complete with variable speed controller for soft start/stop and has proximity switches mounted on the base to sense position and control rotation of product. Turntable speed is 3 Revolutions per minute with a 1 HP 460/3/60 gearmotor. An 8-wire collector ring allows unlimited rotation of turntable. Powered transition rollers, mounted on apron of turntable deck, help move product onto and off of turntable. The 26 CRR section has a Side Mounted Drive contained within the turning radius of the turntable. Standard speed is 30 FPM with 1/2 HP 460/3/60 gearmotor. The tread rollers are 2 5/8 in. diameter with 7 gauge wall on 4 in. roller centers and have 2 5/8 in. dia. x .219 wall drive rollers with heavy duty bearings. Also available; gravity transition rollers; external transition roller sections (mounted to mating conveyors to fill in gap created by radius of turntable). Minimum Elevation - 16 inches.